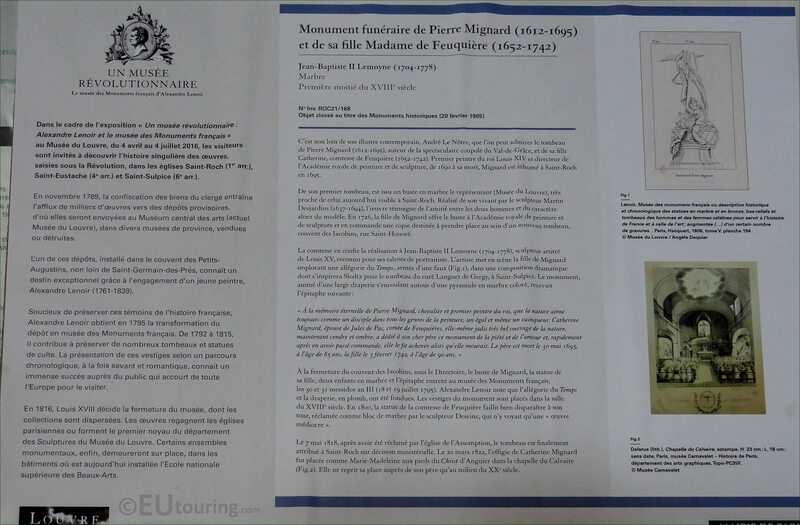 We were at the Eglise Saint-Roch in the 1st Arrondissement of Paris located on the Rue Saint-Honore, when we took these high definition photos showing a Funerary Monument to Pierre Mignard and his daughter Catherine, Countess Feuquieres, which was sculpted by Jean-Baptiste II Lemoyne, Lemoyne the Younger. This first HD photo shows a statue group with a young lady kneeling and praying, depicted as though she is sobbing, and above this you can see the bust statue, which depicts Pierre Mignard, and this was originally just a part of the Funerary Monument to Pierre Mignard, that was commissioned by his daughter, Catherine, the Countess Feuquiere. Initially a bust was produced by Martin Desjardins portraying Pierre Mignard who was the First Painter of King Louis XIV and Director of the Royal Academy of Painting and Sculpture, from 1690 to his death, which was then donated to the Academie Royale de Peinture et de Sculpture by his daughter, Catherine, Countess Feuquiere. Yet she decided to commission Jean-Baptiste II Lemoyne, also referred to as Jean-Baptiste Lemoyne, the Younger, the Funerary Monument to Pierre Mignard in 1735 which included a copy of the bust by Desjardins and this was installed in the Jacobins, however, this particular church was destroyed and with it some of this monument, which originally included two children referred to as geniuses of the arts along with an allegory depicting Time. 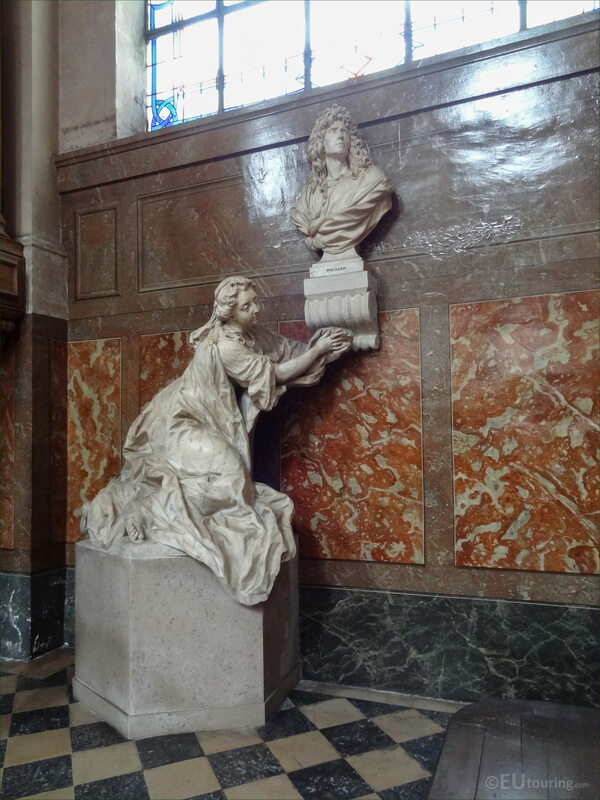 So all that remains is the bust of Pierre Mignard and the female figure depicting his daughter Catherine, Countess Feuquiere, both sculpted in marble by Jean-Baptiste II Lemoyne, which was transferred to the Eglise Saint-Roch, where it was installed within one of the side chapels called the Chapelle Saint-Nicolas. 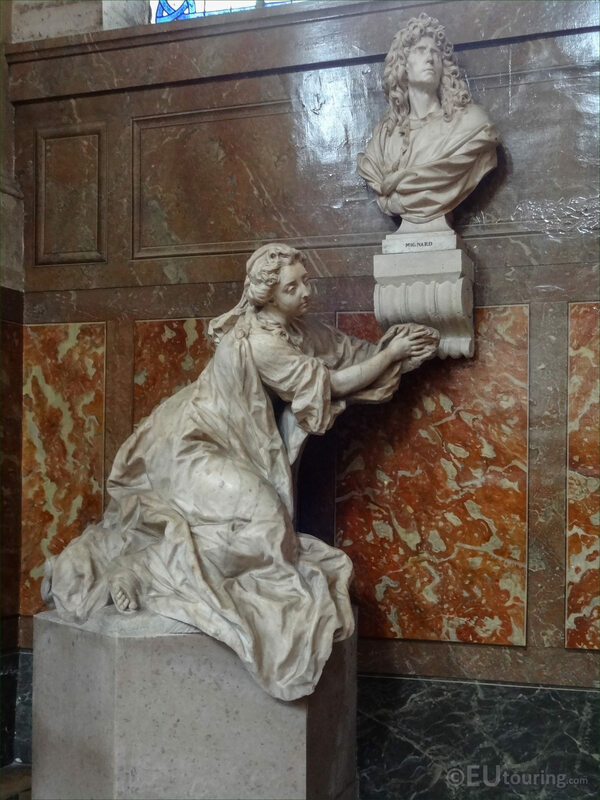 Now according to some sources, even though the funerary monument, which has a full title of Monument funeraire de Pierre Mignard (1612 - 1695) et de sa fille Madame de Feuquiere (1652 - 1742) was originally meant to be for just Pierre Mignard, it became a funerary monument to his daughter Catherine, Countess Feuquiere as well, as she passed away before the entire composition was finished in 1744 by the French sculptor Jean-Baptiste II Lemoyne, who was renowned for his portrait busts. To the eternal memory of Pierre Mignard, knight and first painter of the king, that nature always loved as a disciple in all genres of the painting, an equal and even a winner. Catherine Mignard, wife of Jules De Pas, Count of Feuquieres, herself once a very fine work of nature, now ash and shadow, has devoted to her dear father this monument of piety and love. The father died on 30th May 1695, at the age of 85 years, daughter on 3rd February 1742, at the age of 90 years. 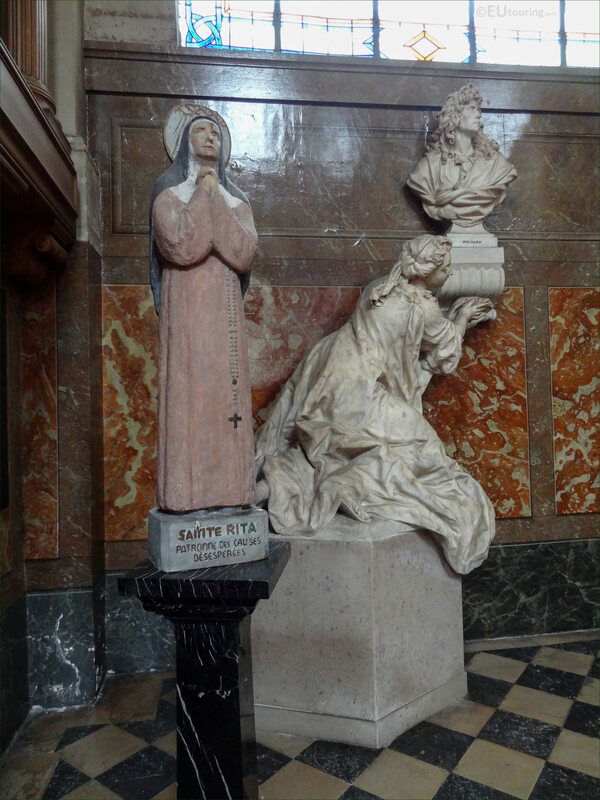 Plus this statue group was also classified as an historical monument on 20th February 1905, with an inventory number of ROC21/168 that can still be seen today within the Eglise Saint-Roch located on the Rue Saint-Honore in the 1st Arrondissement of Paris.